Since 2012, Dr Mark Wheeler from the University of Essex has been investigating alternatives to formal treatment for military veterans with Post-Traumatic Stress Disorder. Early pilot studies looked at falconry, archery and horse riding, but it was when his research examined the benefits of angling that he realised he had something with potential to help. Since then Dr Wheeler and Dr Cooper, from the psychology department, have been running regular studies collecting data to help prove their theories. Studies began originally over two days, and one night trip, taking groups of approximately 10 veterans, all with a diagnosis of PTSD, to venues in the UK. At the onset, Dr Wheeler was reliant on the generosity of commercial lake owners to provide time and access to their venues for the studies at no cost. Similarly, he looked to tackle and bait companies to donate resources to facilitate the trips. Angling coaches were used to tutor the non-fishermen and less experienced members of the groups, and also to give advice and tips to the more knowledgeable among the group. To explore the possible benefits the trips may have had on the military veterans’ symptoms, psychological tests were carried out before and after the trips, to measure change in the symptoms of PTSD, depression, anxiety, stress and work and social adjustment. To add clarity Dr Wheeler also interviewed the participants to explore their experiences and thoughts about the trip. Results when analysed demonstrated significant improvement across all the areas examined and the research went on to win the University Research Impact Award for Health and Science. In the late autumn of 2018 Dr Wheeler and Dr Cooper formed a non-profit community interest company (CIC) called Investigating Countryside and Angling Research Projects (iCARP) and began to put together a trip to France for ten veterans, again all with a formal diagnosis of PTSD. Due to the promised funding falling through, a crowdfunding campaign was launched and successfully raised the shortfall and participants for the trip were sought via social media. The group recruited came from across the UK, varying in age from 26 years old up to 59, and were of mixed levels of fishing experience. The study took place at the beautiful Le Queroy in France across both of their lakes, Napoleonic and Elba. One experienced angling coach was allocated to each pair of veterans and they were also provided with tackle and bait as required. The trip was attended by psychologists, first aiders and researchers to manage any eventualities and collect further data. Finally, a documentary team followed the veterans on their journey and there is hope for this to receive a TV release in 2019. Despite poor weather conditions, the week started well, with Ben Cummings catching his PB carp, a gorgeous 37lb mirror from Napoleonic Lake. Ben’s previous PB had been 12lb and his smile remained all week after that start. Not to be outdone, also on Napoleonic, non-angler Stewart Bayford began his carp fishing ‘career’ by landing a 39lb mirror. 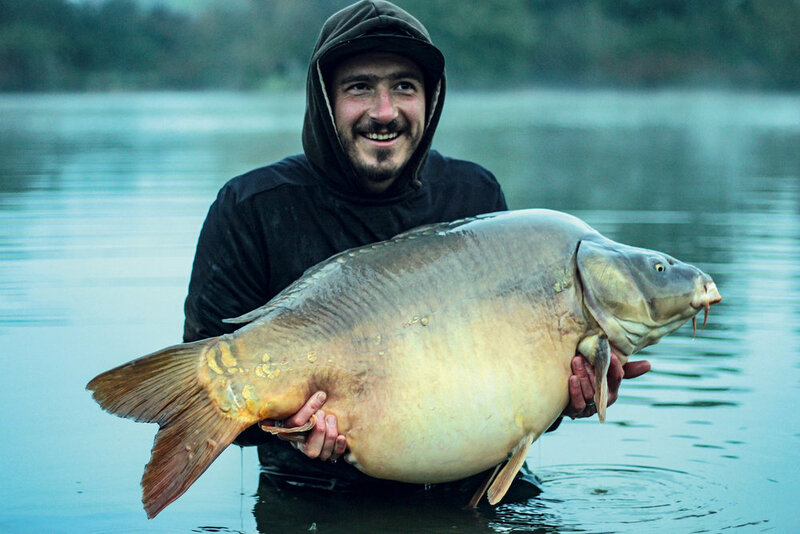 Over on Elba, Ryan Johnson, ex-Royal Anglican, caught his PB too with a 40lb mirror. Hot on Ryan’s heels was his angling partner, Adam Loader, also an ex-Royal Anglican, who then caught not only his personal best but also a new lake record for Elba, in the form of a high-shouldered mirror of over 57lb that was then christened Big Loretta. Through the week further PBs were caught, Ben beating his new PB with an enormous 52lb 2oz mirror and Dan Lloyd landing a stunning 51lb plus mirror. Fish were caught by all bar two of the participants in cold and wet conditions. Perhaps more importantly, due to the diligence and care of the iCARP team, all of the participants felt strong and comfortable enough to not only enjoy the fishing, but also to contribute to the data collection. It is early days regarding the data from this trip but indications are positive. The narrative from all that attended was that they felt they had all really benefitted from the trip. iCARP continues to stay in touch with all the participants, and a reunion trip in the UK is currently being arranged. Discussions over funding for the project are ongoing with the Lottery Fund and others. With support from Korda, Mainline and the East of England CO-OP as well as a promise of use of the Le Queroy lakes next year, iCARP intend to continue helping this deserving group in finding some relief from their symptoms via the fishing bank.